Here is a wonderful success story from our client Angie. The products she uses to help her kitties, Max and Sasha, with stomatitis are Power Probiotic for Pets, Colostrom for Pets, Immune Harmony, and Quentans. "Back in 2010, I adopted 2 kitties from an elderly gentleman who had been on the news. The news story said that Animal Control was going to come in and take all the old man's kitties and euthanize them if no one stepped forth to adopt them (supposedly because he had too many living in the city limits - a neighbor who didn't like him or the cats had complained and turned him in). They were all so friendly! They acted like I visited the house all the time! So it was quite difficult for me to make my selections. I finally settled on this huge one - a domestic shorthair - that looked like a miniature black panther. I named him Max. He was lean and silky, so regal, and looked like he could be a formidable foe to anything threatening him. Next I selected his sister, a shy dainty puff ball of black fur... pure princess to every degree. So she became known as Sasha. We all lived in bliss until I had to take a work detail overseas for a month. I was forced to leave my babies behind in the care of a veterinary hospital for boarding until I returned. The cats were "different" it seemed when we returned home. Max wasn't as zealous and playful and Sasha was just totally terrified of everything! I took them to their regular vet and that's when I found out that Max was suffering from a severe case of stomatitis and Sasha's case was mild. For almost a year, Max suffered through rounds of antibiotic and steroid shots trying to calm his symptoms just so he'd be able to eat. He got so skinny and was so miserable, I didn't know what else to do. I began to scour the internet on alternative therapies and tried everything from switching food to switching litter. Finally a couple of years ago, I ran across the AskAriel site. And amazingly, there was a section all about stomatitis. I read everything I could find about it and even read about the other different conditions house pets can contract. The answers were reasonable so I placed my first order for some of the Power Probiotic. I also received a food recommendation from Ask Ariel that I was able to find in my local pet store. Over the next few months I continued to "fine-tune" Max's specific needs. Ask Ariel gave me recommendations about foods to avoid that would make the stomatitis worse. 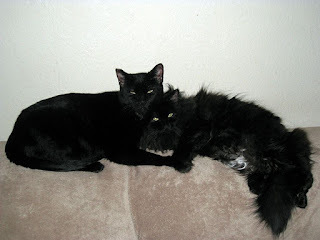 In June of 2014, I took Max and Sasha to the vet one last time to have their teeth thoroughly cleaned, and Max received his steroid and antibiotic shots. After that, we started daily treatments with the supplements and recommended diet. In June 2015, we visited the vet for the first time since the cleaning (for a different condition) and she was thoroughly impressed and said she didn't see anything unusual... no redness, no sores, no buildup on the teeth or anything! She couldn't believe I was only feeding them wet food (not the dry her office had originally recommended) and nothing else. Anyway, I now have two of the happiest kitties on the planet! They are both in the elderly stage now with a few grey whiskers and a few strands of grey hair here and there coming out of their beautiful black coats, but Max loves playing the "baby" (even though he's the eldest)...Sasha has finally gotten over her fears as well. She loves to be picked up, but differently than Max. When she approaches you, she'll just sit there and wait, looking at you. When you reach down to pick her up she'll throw her little arms up in the air like a toddler begging. Then you'll have to pick her up and put her on your hip where she then likes to ride with her arms around your neck as she nuzzles your face. Yes, I know it's a long success story but *my* kitties are extraordinary. Thanks for coming up with such amazing products!"